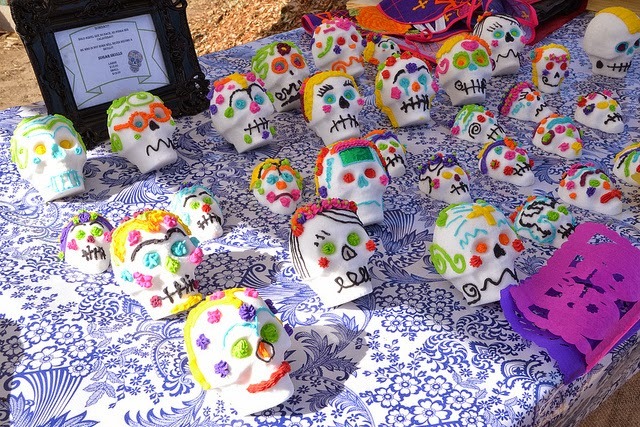 My neighborhood in Tierrasanta is transforming itself into a Vincent Price playground of ghosts and pumpkins, skeletons, and rattling chains. Faux and real spider webs drape from trees, and it won't be long until little goblins and superheroes and princesses will begin ringing doorbells for a sugar fix. But this time of year isn't limited to Halloween. 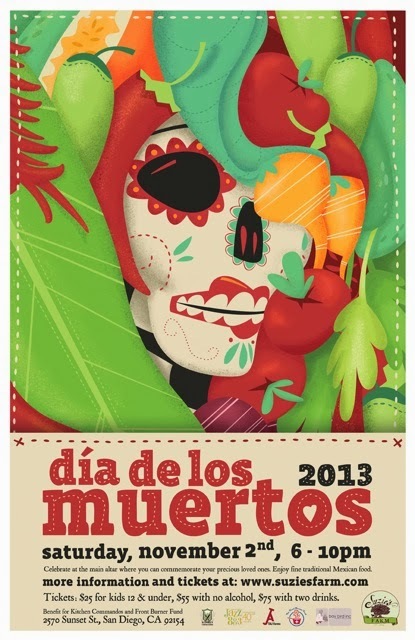 If you want a true celebration of the dead, you've got to give yourself over to Dia de los Muertos, or Day of the Dead. 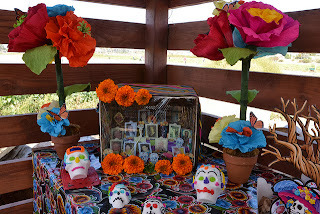 It's a special time in Mexico to remember loved ones who have passed and Americans are now embracing it, too. Suzie's Farm will be hosting a family-friendly Dia de los Muertos party on Nov. 2 from 6 to 10 p.m. at their new two-acre outdoor event space, The Grove. Proceeds will benefit non-profit organizations Kitchen Commandos (which teaches families healthy cooking skills) and The Front Burner Fund (which provides funds to supplement health costs and emergency medical needs for "back of the house" restaurant staff). 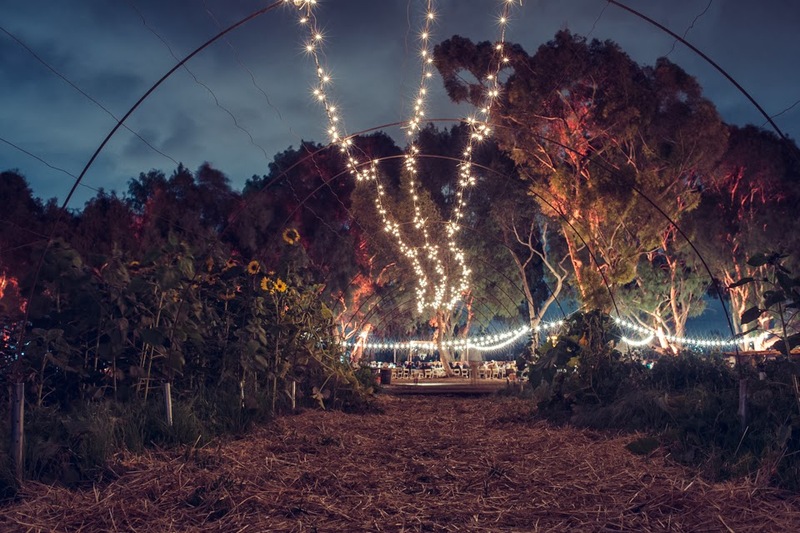 So, what will you find at Suzie's Farm that evening? Chef Flor Franco of Indulge Contemporary Catering has lined up chefs including Javier Plascencia (Mision 19), Isabel Cruz (Barrio Star), Andrew Spurgin, Maylin Chavez, and others who will provide tastings inspired by traditional Mexican dishes like mole, sopes, and chile rellenos. There will also be craft cocktails and beverages from Alchemy Cultural Fare and live music from Jazz 88.3's Latin Grooves. And, scads of people like you in costume! Yes, they'd love everyone to dress up! Tickets are $75 for adults (including two drink tickets), $55 for adults (no drinks), and $25 for children 12 and under. You can purchase tickets on their website. Suzie's Farm is located at 2570 Sunset Ave. in San Diego, just 13 miles south of downtown San Diego.